Das Museum of Manufactured Response to Absence (MoMRtA - Museum der gefertigten Antwort auf Abwesenheit) hinterfragt die Auswirkungen der Präsenz oder Abwesenheit von Minderheitsgemeinden und Subkulturen auf die Nationen, in denen sie ihren Wohnsitz haben. Im Speziellen untersucht MoMRtA den undokumentierten Impakt der einzigartigen palästinensischen Gesellschaft, die sich in Kuwait herausbildete und zur Modernisierung von Kuwait beitrug und diese erlebte, sowie die in dieser Hinsicht wegweisenden Projekte. Die Erkundung erfolgt vermittels einer Sammlung von achtundzwanzig speziell dafür in Auftrag gegebenen Objekten, die sich zielgerichtet mit dem Verblassen der goldenen Ära der kuwaitischen und palästinensisch-kuwaitischen Gesellschaft beschäftigen und dadurch an sie erinnern. MoMRtA nutzt Kunsthandwerk, Kunst und Erinnerungsstücke, um ein Ausstellungsprojekt zu produzieren, das als eine Intervention im Museum Moderner Kunst in Kuwait am 22. Mai 2012 unter der Schirmherrschaft des Nationalen Rats für Kultur, Künste und Literatur des Staates Kuwait eröffnet wurde. MoMRtA is an independent authority that reflexively poses questions about who possesses the right to produce a museum like itself. It embodies a proposal for explaining this faltering history while at the same time questions the conditions of a museum in general. Its objects are similar to those required by any museum, inextricably and uniquely linked to the existence of Palestinians in Kuwait as much as to the universal, collective, personal, and arguable nature of all museo-artifacts. This museum attempts to free its objects from the confines of a specific structure or site for permanent display, favoring the rotating of its collection in exhibitions hosted by other museums and spaces both inside and outside of Kuwait. The place and time of an encounter with the museum’s collection continuously change so that there is no local audience who can access it in a permanent, periodic, or fixed way. Instead, a multiplicity of audiences becomes familiar with the museum’s collection through its travels and in its varied forms of display. 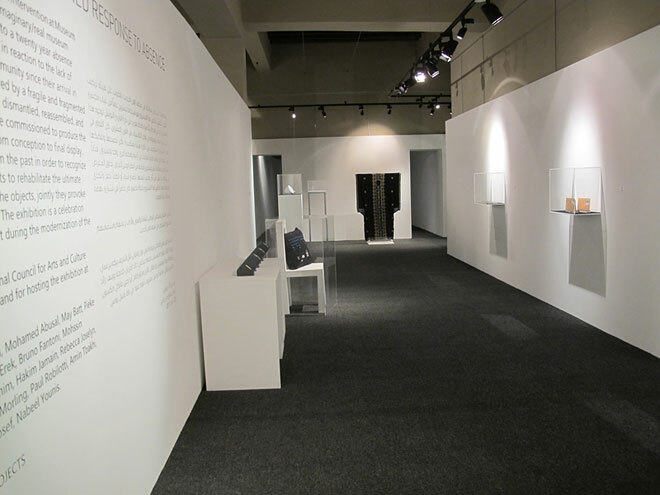 Its first exhibition, however, undoubtedly had to take place in Kuwait. Each fabricated object from this nomadic museum’s collection lies somewhere along a timeline that connects two points derived from Palestinian history. The appearance and material makeup of these objects are without a doubt linked to this period. Gold is a formative material and not just an encasing in Ruler (Cevdet Erek), which takes the shape of a golden time line that begins and ends with two Palestinian calamities: 1948 and 1990. Necklace (Muhannad Abboud) is also carved in gold and reads “We are all for Kuwait, and Kuwait is for us”, a famous contractual phrase pronounced by the Emir of Kuwait Sheikh Jaber Al-Sabah and reiterated throughout the age of the Ruler by nationals. It is impossible to don this necklace; its chains are two stiff, parallel cylinders that refuse to bend in order to connect its links. The objects in this exhibition are produced from the margins of an existence of which they are an integral element. The viewer must look closely at the decorative details of Dress (Raed Ibrahim) to see how its usual Kuwaiti patterns have been replaced with designs from traditional Palestinian cross stitch. The neck opening of this Palestinian/Kuwaiti dress has also been considerably shrunk so much so that it becomes impossible to wear and leaves one only with the possibilities of remaining outside or lying beneath its cover. Today, Palestinians also reside outside of the history book of Kuwait rather than in its midst. The pages of the history book of Palestinians in Kuwait are blank and fading. Their unrecorded history is in the process of dissolving and so too its blank book within the pool of undocumented events in History (Mohssin Harraki). The elements of time wear away at the work while the production of other books that might give proof for or refute the existence of Palestinians in Kuwait continues to be deferred. The museum then embodies another direction, a first-time display, a proposal, a critique of a reading or chronicling of events in a certain light, a document for an unrecorded narrative that slips further and further into oblivion. The disappearance of this history is not unlike the inevitable vanishing of traces inherent in the fragile surface of Memory (Min Rasy). Formed from Kuwait’s dust, any impressions left behind shift and change at the slightest touch. Memory dares to willingly acknowledge and enable the impossibility of affixing a memory of a place. In Fils (Mesrop), a section from the heart of the local currency is removed and transplanted to Palestine. At that time, five percent of the salaries of Palestinians in Kuwait was donated to the Palestinian Liberation Organization (PLO), with other amounts given to support varied sustainable development projects aimed at building the Palestinian nation and feeding and educating its people. These percentages and donations were tallied to what was spent in the local markets of Kuwait on an assortment of living needs. The Kuwaiti fils in some way then becomes a Palestinian qursh too. And while many Palestinians in Kuwait did not live meagerly or minimally, the Kuwaiti government itself was generous in its spending on ambitious Palestinian projects that grew from initiatives within. Unions of students, workers, farmers, athletes, women, and the family, and a range of political parties (until 1990), the PLO, and various committees were formed by Kuwaitis for Palestine and the Palestinian people. Year after year, Kuwait supported Palestinian athletics teams who played for fourteen clubs, each of which was named after a Palestinian city. In the map Hawalli (Mohamed Abusal), indicated lines of movement emphasize the circulation embodied by projects, facilities, housing developments, and schools in the area of Hawalli, a once heavily populated Palestinian area in Kuwait city. These lines emerge from Hawalli to connect with other areas in Kuwait and then extend to link with projects beyond its borders, from schools, universities, and mosques in Palestine to refugee camps, houses, and educational initiatives in Lebanon, Jordan, and Egypt, reaching as far as international sporting events like the 1984 Olympics in California. The work Yalazrag (Mohssin Al Tamar) references the five minute segment that preceded the daily eight am news on Kuwaiti radio when the Palestinian league games were played out in Kuwait’s stadiums. The fourteen Palestinian clubs competed on Kuwaiti soil in various athletic games, from soccer and basketball to volleyball and boxing, and the results of these games were announced in local newspapers side by side with the results of the Kuwaiti league and other local competitions. The first sentence that appears in the Kuwaiti curriculum for elementary writing and that is referenced in the notebook Copy (Bilal Chrif) is “Hamad has a Pencil”. Only in this museum, Hamad can be seen accompanied by fellow student Humus, who carries a pen, in three drawings printed on 35mm transparencies installed in slide viewers. Between 1967 and 1976, many of Kuwait’s public schools held evening shifts to accommodate the large numbers of Palestinian students who arrived in Kuwait following the ‘Naksa’, the defeat of the Arabs in the 1967 war. In the school grounds of the ‘Abdallah Al Salem School’, annual celebrations were held in commemoration of the establishment of the PLO. No doubt that Hamad and Humus’s comradery dates back to when they shared a classroom bench at such a school. The infamous farewell phrase of Kuwaitis, “Don’t Forget Us”, pleadingly warns those departing from failing to recollect. This single phrase, etched onto Soap (Amin Al Tabakhi), is inherently threatened by dissolution in each new instance of use. In the collection is another object that intentionally disintegrates in the space and time of its display. It is a giant orange Celebration (Ziad Hilal) cake that brings to mind the fruits of Jaffa and pays tribute to its vast orchards, especially of olive trees. These were the trees that seasonally bore olives and oil, transported from Palestine to Palestinians around the world including Kuwait. A real-size reproduction of an oil tank is presented as a Trophy (Rebecca Joselyn) within the museum. Created from pure silver, the tank is marked with English hallmark stamps, no doubt pertaining to the time in which this object was produced. Palestinians were the trophy bestowed by the British Mandate at its end to the region, Kuwait being no exception. The environment of Kuwait forms the backdrop for the museum’s collection among which is a glass sandglobe. Visitors must shake the sandglobe for the sand within it to take on the appearance of Touz (Michael Dickson) whirlwinds particular to Kuwait. In contrast with the grains of sand that rustle around, time appears frozen in a decorative pillow that reveals a screenshot from the famous game of Atari entitled Conditions (Khadijeh Yosef). Popular during this period in Kuwait’s history, Atari was an essential part and reflection of the technological particularities and living circumstances afforded by it and shared by Kuwaitis and Palestinians alike. Palestinians in Kuwait and Kuwaitis were also challenged by the same dangers and threats. One common threat was that posed by the oil spill in the Nowruz Field in Iran, creeping across the Arabian Gulf towards the shores of Kuwait. “Yatna Bug’at el Zait” (The Oil Spill is Approaching) is one of the songs that overtook the country to raise awareness among inhabitants, in a humorous fashion albeit, of the potential incoming threat. Hanging from the ceiling of the museum is an electrically charged glass lighting fixture in the shape of an oil drop on the verge of leaking that happens to be a Lightbulb (Pieke Bergmans). The threat of the oil spill returns only in a more violent form post-1990. This museum’s collection questions if the home of Palestinians in Kuwait was formed and connected to the memory of entire generations before it was connected to their destinies. No Home is an updated version of Zakaria Tamer and Muhieddine El Labbad’s story that revisits the encasings that typically housed objects in Kuwait during the era of the golden ruler. Architectural plans of houses, almost identical to those inhabited by Palestinians in Kuwait, are etched in the work Home (George Vlosich) using the game Etch-a-Sketch and encased in its famous red frame. Künstler: Kamel Abu Yahya, Mohamed Abusal, May Batt, Pieke Bergmans, Bilal Chrif, Cevdet Erek, Bruno Fantoni, Khalid Al Harban, Mohssin Harraki, Zyad Hilal, Raed Ibrahim, Hakim Jamain, Bengü Karaduman, Rebecca Joselyn, Katharine Morling, Paul Ribolotti, Amin Tbakhi, George Vlosich, Khadijeh Yosef, and Nabeel Younis. Präsentiert unter der Schirmherrschaft des Nationalen Rats für Kultur, Künste und Literatur des Staates Kuwait.